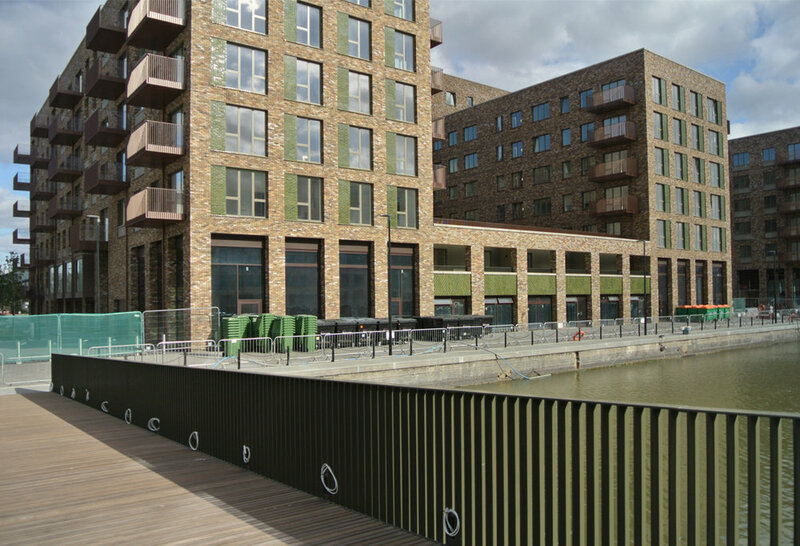 Dock Bridge, the 'centre piece' of the Great Eastern Quays masterplan designed by Maccreanor Lavington and eHRW (Jane Wernick Associates) for Notting Hill Housing Trust. Despite all the complexities the site had to offer, the bridge is in place and ready for final installations. View west of the Royal Albert Wharf impoounding Dock with two miles of Royal Docks stretching into the distance. The 'workings of the lifting mechanism fully exposed to celebrate this modern interpretation of the traditional Dutch bascule bridge. The bridge forms an extension to the public realm, by forming a continuous loop of the commercial dockside, with the colour and materiality relating to the dockside buildings. Simple elemental detailing has been used to create an elegant interpretation of an industrial aesthetic. View of the dock approach from Gallions Reach DLR station showing Great Eastern Quays - a.k.a.Royal Albert Wharf phase one. The moving parts of the bridge down touch but float in front of each other creating a tectonic interplay and layering. The narrow Cumaru decking relates to the naturally weathering dockside materials. ©Akay Zorlu 2019. This website and its content is copyright of Akay Zorlu. All rights reserved. This copyright doesn't include projects undertaken on behalf of other practices as indicated, for more information click here.